Whether you're looking to build lean muscles, tone up, slim down or you're just seeking a healthy addition to your diet, Whey Gourmet is the perfect fit. Whey Gourmet is so incredibly delicious, you'll have no problem sticking to your nutrition plan and reaching your goals. It's the gourmet flavour you crave, the formula you've been waiting for and the nutrition your body requires. Whey Gourmet is a shake you'll actually be excited to drink, plus you'll be invigorated each time by the boost of quality protein needed for muscle repair and recovery. High in calcium, rich in essential amino acids and low in fat and carbohydrates, Whey Gourmet works hard to build lean muscle mass and power your active lifestyle. Not just for athletes, Whey Gourmet is an excellent source of quality protein for the whole family. When you enjoy a Whey Gourmet shake you'll feel like you're indulging in a smooth, creamy dessert but this is a treat you can enjoy without the guilt. Plus at 21 g of protein per serving you won't feel hungry or deprived, but rather energized and ready to tackle your day. Whey Gourmet can power you through an early morning meeting, a busy afternoon with the kids or that evening gym session. The flavour is so delicious simply mixed with water that Whey Gourmet can easily be enjoyed anytime, anywhere. There's no blending required for a smooth, creamy texture that's sure to deliver the flavour you're looking for. 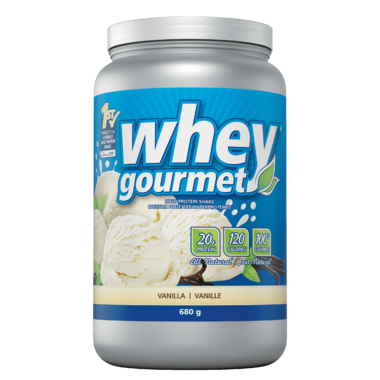 Whey Gourmet is made with a blend of whey protein to make it rich and thick like a shake should be. The body feels fuller and the mind feels satisfied after drinking a Whey Gourmet shake. This is the best tasting whey protein. I love chocolate one the most. I have IBS and lactose intolerance but this one is super easy to digest even for me. I have been a fan of whey protein powders for over twenty years, having learned how nutritious and easy they can be especially for breakfast from my father, who was also a fan of whey protein. Whey Gourmet is one of the best I have encountered for taste, ease of mixing, and comfort. By that I mean that a shake made using this whey powder does NOT leave me feeling bloated or uncomfortable like some have. I love the vanilla, but also the chocolate flavors. Sometimes, if I am in a hurry and don't want to wake my family by running the blender, I will mix or shake the powder with almond or cashew milk, or nonfat milk, and with or without other ingredients, I can eat it from a spoon, like a pudding or yogurt. Yummy and satisfying, and no lumps! I feel well satisfied and full until (a usually late) lunch. I've been searching for well-priced, tasty protein shakes, and this one is a winner on both counts. I tried the expensive "Isa" shakes for a month, and liked them, but Whey Gourmet is just as good, and much more reasonably priced. This tastes really yummy especially when blended with half a banana and frozen berries! it mixes well and doesnt leave an aftertaste like most protein powders! Great tasting and always an excellent whey protein product choice! Delicious protein powder. Excellent shaken in my almond milk, blended in a smoothie, or baked into muffins or protein bars. This product isn't available where I live so thank you well.ca for getting it to me!